This toxin has been shown to be the key virulence factor in infection with C. perfringens; the bacterium is unable to cause disease without this toxin. Further, vaccination against the alpha toxin toxoid protects mice against C. perfringens gas gangrene. As a result, knowledge about the function of this particular protein greatly aids understanding of myonecrosis. The alpha toxin has remarkable similarity to toxins produced by other bacteria as well as natural enzymes. There is significant homology with phospholipase C enzymes from Bacillus cereus, C. bifermentans, and Listeria monocytogenes. The C terminal domain shows similarity with non-bacterial enzymes such as pancreatic lipase, soybean lipoxygenase, and synaptotagmin I. The alpha toxin is a zinc metallophospholipase, requiring zinc for activation. 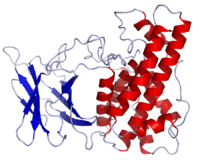 First, the toxin binds to a binding site on the cell surface. The C-terminal C2-like PLAT domain binds calcium and allows the toxin to bind to the phospholipid head-groups on the cell surface. The C-terminal domain enters the phospholipid bilayer. The N-terminal domain has phospholipase activity. This property allows hydrolysis of phospholipids such as phosphatidyl choline, mimicking endogenous phospholipase C. The hydrolysis of phosphatidyl choline produces diacylglycerol, which activates a variety of second messenger pathways. The end-result includes activation of arachidonic acid pathway and production of thromboxane A2, production of IL-8, platelet-activating factor, and several intercellular adhesion molecules. These actions combine to cause edema due to increased vascular permeability. ↑ Awad, M.M. ; Bryant, A.E. ; Stevens, D.L. & Rood, J.I. (1995). "Virulence studies on chromosomal alpha-toxin and alpha-toxin mutants constructed by allelic exchange provide genetic evidence for the essential role of alpha-toxin in Clostridium perfringens-mediated gas gangrene". Mol Microbiol. 15 (2): 191–202. doi:10.1111/j.1365-2958.1995.tb02234.x. PMID 7746141. ↑ Williamson ED & Titball RW (1993). "A genetically engineered vaccine against the alpha-toxin of Clostridium perfringens also protects mice against experimental gas gangrene". Vaccine. 11 (12): 1253–1258. doi:10.1016/0264-410X(93)90051-X. PMID 8256506. 1 2 Sakurai J, Nagahama M, Oda M (2004). "Clostridium perfringens Alpha-Toxin: Characterization and Mode of Action". J Biochem. 136 (5): 569–574. doi:10.1093/jb/mvh161. PMID 15632295. ↑ Naylor CE, Eaton JT, Howells A, et al. (1998). "Structure of the key toxin in gas gangrene". Nature Structural & Molecular Biology. 5 (8): 738–746. doi:10.1038/1447. PMID 9699639.